Broccoli Cashew SaladFeel the crunch! 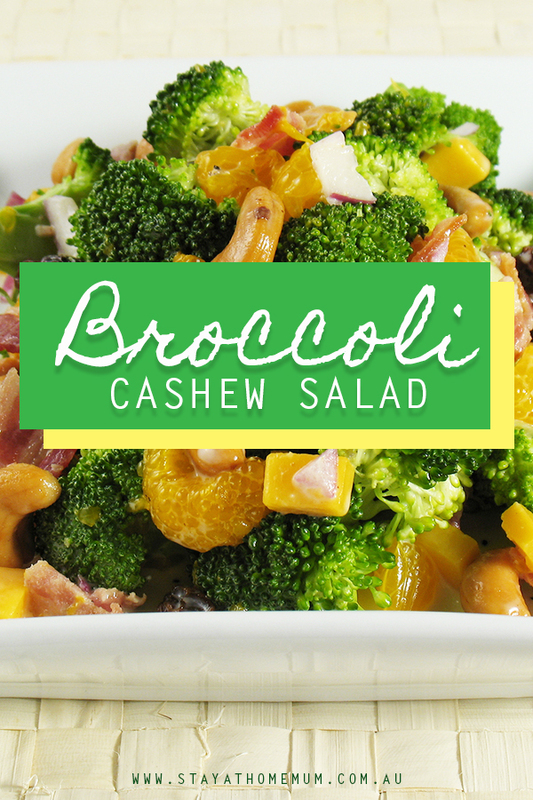 Broccoli Cashew Salad is a scrumptious salad with all the textures and crunch the ingredients provide. Fresh broccoli and cashews, yum yum yum. Broccoli Cashew Salad is a scrumptious salad with all the textures and crunch the ingredients provide. Fresh broccoli and cashews, yum yum yum. Cook the bacon in a pan. Set aside. In a large mixing bowl, combine mayonnaise, cider vinegar, and sugar. Whisk together until sugar is dissolved. Add the broccoli, bacon, and cashews together. Mix together until the salad is coated well in the mayonnaise mixture. Chill for 2 hours and let stand for 15 minutes before serving. Broccoli Cashew Salad is not suitable for freezing.